Narconon Florida in Clearwater is part of the international network of 100 Narconon centers providing drug rehabilitation, education and prevention services from the sunny southern United States to the frozen tundra of Siberia. 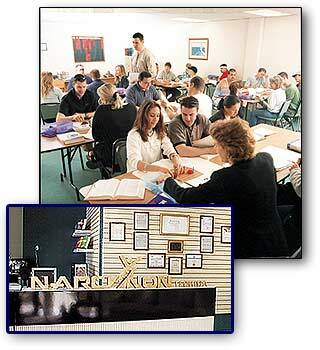 The Narconon program, involving withdrawal, detoxification and study courses to help students master life skills, is acclaimed world wide for its results: an average of more than 70% of students completing the program remain drug-free. When Ted lost the job he had held for 17 years and his house went into foreclosure not long after that, it was almost an anticlimax. After all, his wife and children had already left him and he could not remember ever being anything but deeply in debt. At 42 years old, crack cocaine was ruling his life, a life that seemed little more than a constant struggle with paranoia, a sick body and isolation from the rest of the world. Alone, broke and taking a hard look at his life, Ted was desperate to make a change but did not know how. He wanted help so bad that he loaded crack into his car and parked next to a cop, trying to get up enough nerve to attract the officer's attention and get arrested. He even failed at that. Finally he called his father, opening up about his addiction for the first time. Ted was lucky. His father was very supportive and helped him enroll with an inpatient drug rehab program in Tampa. Sixty days later, Ted came out of the program off crack and on a mission to stay clean. That resolve, however, lasted for only three months when Ted relapsed. Then he heard about the Narconon outpatient drug rehab program in Clearwater. "Narconon is the most common sense program to kick a drug habit," Ted said, now clean for 12 months after doing the Narconon program. "It cleans the body to where you don't have the urges to do the drugs." Founded in 1966 by Arizona State inmate William Benitez, Narconon has grown internationally, with drug rehabilitation and drug prevention education programs funded by governments and social reform groups around the world. Based on the drug detoxification protocols developed by L. Ron Hubbard, Narconon does not use drugs nor does it treat drug abuse as an illness. "The addict has been found not to want to be an addict, but is driven by pain and environmental hopelessness. As soon as an addict can feel healthier and more competent mentally and physically without drugs than he does on drugs, he ceases to require drugs," L. Ron Hubbard said. The Narconon program is based on the premise that drug residuals remain stored in the body fat and can cause an addict to reexperience cravings for drugs even after he has stopped taking them. When a person is under stress or engaged in strenuous activity, tiny residuals seep out of the body fat and reenter the bloodstream. The individual suddenly gets a small "taste" of the drug and instantly wants more. Thus, even when many addicts stop taking drugs, they later relapse. "If I hadn't come off the drugs, I'd be dead. ...I did the Narconon program. Now, I have a future." The Narconon program uses a regimen of vitamins, exercise and sauna to rid the body of drug residuals and enable the individual to free himself from drug cravings. The Narconon Clearwater program was recently reviewed by Dr. Betty Buchan, Vice President of Research at Operation PAR, an addiction research and treatment program located in five counties of the Tampa Bay area. In her position, Dr. Buchan evaluates different types of methods for substance abuse treatment in the Tampa Bay community. "The thing that impressed me the most in the Narconon program is that it uses a natural healing approach toward substance abuse. Diet, exercise, nutrition, rest, lots of clean water intake — these are some of the most important aspects of developing a healthy body. Narconon's primary focus is a healthy body and healthy mind. When you have these, you are less likely to abuse drugs," Buchan said. Individuals, like Ted, who have completed the Narconon drug detoxification say it saved their lives. "If I hadn't come off the drugs, I'd be dead. When I did the Narconon program, I felt healthier almost immediately so I could deal with situations in life much better. Now I have a future," Ted said. Narconon Arrowhead in Oklahoma (left), the largest residential center of its kind in the U.S., is also the international training facility for Narconon centers such as (clockwise from above) Spain, Switzerland and Sweden. Unfortunately, street drugs are not the only substances causing life-threatening addictions in American society today. When Norma, a grandmother of six, started having a very rapid heartbeat two years ago, she was rushed to the emergency room at a local hospital. The hospital had her undergo a series of heart tests and put her on a drug that is often prescribed for anxiety. Although a full battery of tests showed no heart problems, Norma was kept on the drug daily for three months. A whole set of new symptoms appeared. She became agoraphobic. Her muscles twitched so badly it was almost impossible to draw blood from her arm. She couldn't carry on a conversation or focus. She became fearful of anything that moved. Norma felt these new symptoms could only be the result of taking the drug, as she had never experienced them before the prescription. Nothing had been found to be physically wrong with her in all her testing, so she went back to the doctor for advice. The doctor recommended she take yet another drug. Taking a second drug to compensate for problems created by the first one did not make sense to Norma. On her own, she decided to stop taking the drug. It was then she discovered she had become addicted. Withdrawal was a nightmare. She felt like there were bugs crawling all over her. Sounds and light were magnified a thousand times. Her body vibrated and she felt like she was not connected in any way to the world. Miraculously, she was able to wean herself off the drug. She was lucky — serious complications that can result during withdrawal from even low dosages of some drugs include epileptic seizures and death. Being off the drug, however, did not mean being free of its effects. Norma still suffered intense cravings for it and daily had to resist the urge to start again. She urgently needed a solution. Fortunately, Norma found out about the Narconon program from her chiropractor; finally she found the help she needed. Norma's first step in her battle to free herself from the drug cravings was the Narconon detoxification program. Narconon requires comprehensive medical testing prior to detoxification. "Norma had completed a full battery of tests under her medical doctor who then allowed her to do the detoxification program," said Clearwater Narconon Director Cheryl Alderman. Utilizing Narconon's nutritionally based detox program along with the specialized procedures to help her through some of the worst periods, Norma was able to free herself entirely from the drug. "Narconon saved my life. There is no way I could have come off without that program and the constant support of Cheryl [Narconon Director]. I could not have made it through," Norma said. Similar words echo in nations around the world, as thousands are freed from the chains of drug addiction, and are able to lead drug-free lives and restore their families, often for the first time in years.